I really did love my old Craigslist Dining Room. It was my Pottery Barn look for about 100 bucks, including furniture purchases. I was almost sad to see it go. Ok, I’m done being sad. ‘Cause look at this! We were on vacation in Oregon, when we stopped at Costco for milk and lunch meat (because you can’t beat the price of Costco’s milk or lunch meat). 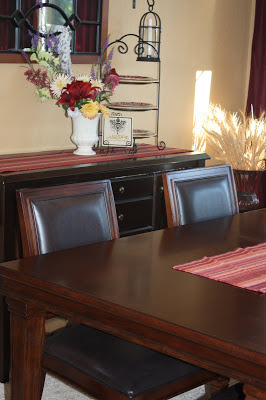 My hubby spotted a dining table and chairs that he said he really liked. I didn’t even look at it. 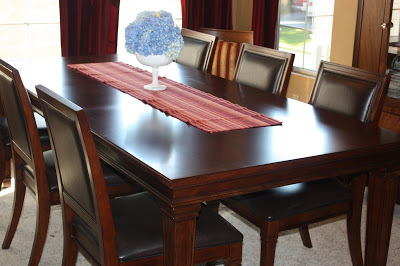 We came home and he mentioned, again, that I should take a look at the table from Costco. 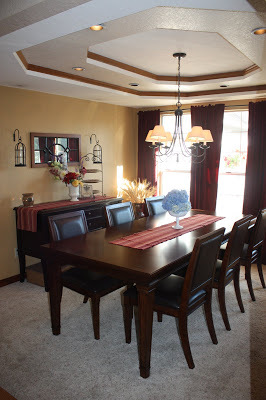 Now, I loved the look of my Pottery Barn/Craigslist dining room, but I didn’t love the feel quite as much. The set was a little rickety and I was always afraid my grandma would sit in the broken chair and it would collapse underneath her. (Not because she’s a heavy woman – she’s only about 95 pounds- but because the chair had been repaired many times.) The next time we went to Costco my hubby showed me the table…. I kind of liked the table. I can’t say this set is truly “me”, since I would probably pick something with rich, warm fabric from Calico Corners. But, this set DID melt my heart a little. We had a buffet in the living room that I thought would match perfectly, and it did! After a little patience and persistent calling to our local Costcos, we were finally told of a delivery date of furniture shipment to the stores. We were there bright and early, with a borrowed pickup truck. This set was an unbelievable deal! To top it off, I was able to sell my old set for just under $200. Score! Now, I just need to convince my hubby that we should eat dinner here at least once. He says it’s too nice for us to eat on, so we’ll have to wait for the next family party.